Nestled in Taian (Tai'an) Town of Miaoli County, Taiwan, Taian (Tai'an) Hot Spring features two hot spring branches known as the Hushan and Tenglong springs. The spring water passes through Jinshui Village, where most of Taian hot spring accommodations are located. The springs were first found by the leader of Atayal aboriginal tribe- Dulai Gainu. A number of hot spring features were later established during the Japanese colonial period, including a hot spring bathhouse and club for their most exclusive officers. Taian Hot Spring was first known as Shandao Hot Spring. The name derives from its peninsula shape, and later renamed to Taian Hot Spring in 1978 by the old President, Chiang Ching-kuo during his visit. Tai’an Hot Spring is a colorless and odorless alkaline carbonate spring with a temperatue about 47 degrees Celsius. 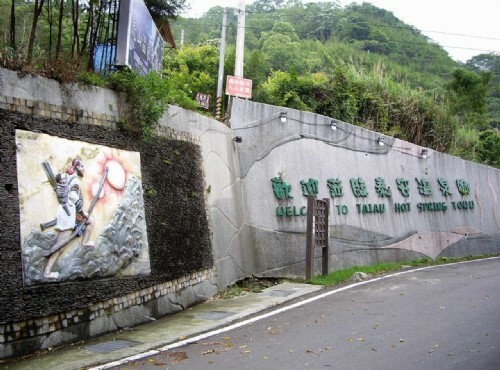 Taian Hot Spring area is mainly resided by the Atayal tribe and Hakka people, where visitors may enjoy a wide array of authentic aboriginal and Hakka delicacies in Taian Hot Spring area, as well as bean curd dishes and Hakka delights at the nearby Chingan Old Street. Taian Hot Spring is a popular alkaline carbonate spring with a temperature about 47 degrees Celsius, pH of 8, colorless and odorless. Take Hsinchu Bus (新竹客運) from Miaoli (苗栗) bound for Dahu (大湖) to Wenshui stop (汶水站). From there, transfer Hsinchu Bus-Chingan route (新竹客運-清安方向) to Chingan Checkpoint (清安檢查哨站) and then take a taxi or walk to Taian Hot Spring area (泰安溫泉區).